Whip the softened butter, cinnamon, pumpkin pie spice and 1 tablespoon of the pumpkin puree. Gradually add the rest of the pumpkin puree as you continue to whip the butter. Add the honey and vanilla and continue beating (1-2 minutes) until thick and fluffy. Scoop into a container for easy serving, or place in a piping bag and pipe it into a glass jar or other container. Serve at room temperature with a drizzle of honey over the top, if desired. This butter should be stored in the refrigerator until ready to use. 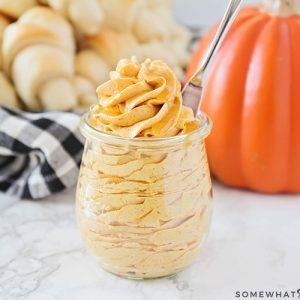 Make sure you are using pumpkin puree and NOT pumpkin pie filling. They are not the same thing and they are not interchangeable. I use electric beaters to whip the butter. I haven't ever used my mixer, but it should work with the wire whip attachment. This may be re-whipped. It will take a couple of minutes to achieve the correct consistency. Don't give up if it begins looking grainy and separated! Keep whipping until smooth and creamy.